The temperature changed to cold here in CO pretty quickly. As soon as the seasons start to transition our minds go straight to fall goodies, one of those favorites being chili! We experimented with a couple different recipes settling on this one as a favorite so far. Just a heads up, my husband really likes to spice up his chili so sometimes I will make a separate dish for the kiddos without so much spice to it. This recipe really had just the right amount of kick though. It can be made on the stovetop or in the crockpot give or take some of the ingredients depending on your preference. Tips: If you are concerned about carb count, lower the amount of tomatoes and increase the amount of radishes- use half a can of tomatoes instead. Use more chicken or bone broth to give additional volume and a thinner base. This chili is the perfect warm and savory recipe for slipping into fall. 1 can tomato sauce (can also be found here on Vitacost) – tomato paste can also be used here, just look for no added sugars. 1. Brown the grass-fed beef and diced onions in a large skillet over medium-high heat. Drain the beef and set aside. 2. On the stove top, use a large pot to add in all ingredients and seasoning. Add the beef last, to prevent sticking. 3. Cook on low-medium, stirring often for about an hour. Let simmer on low for 2-3 hours, the longer it cooks the more flavorful it will taste. 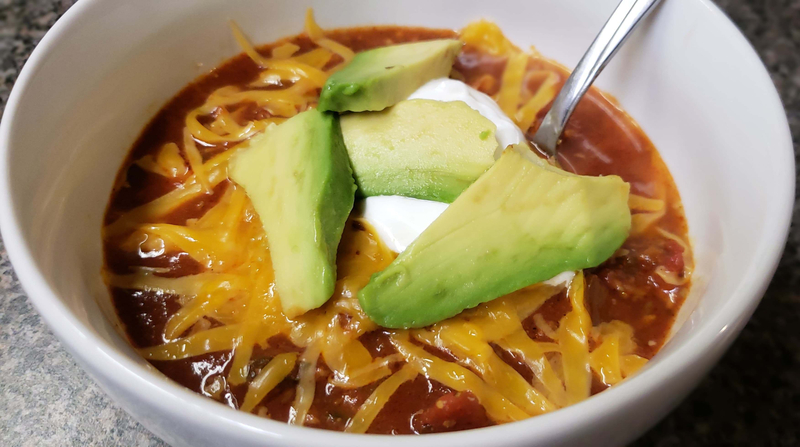 If you are impatiently waiting, you can enjoy a bowl about an hour after cooking but for the best tasting chili wait it out.